The US Army's Research, Development and Engineering Command (RDECOM) Modeling Architecture for Technology, Research, and EXperimentation (MATREX) is the Army’s foremost distributed modeling and simulation (M&S) environment. It is designed to reduce program cost, schedule and technical risk across the acquisition milestone spectrum. The MATREX Program provides a unifying M&S architecture, supporting tools, and an infrastructure that eases the integration and use of multi-resolution Live, Virtual, and Constructive (L-V-C) applications. MATREX enables reconfiguration and reuse of components for: engineering model development and evaluation; technology tradeoffs; capability assessments; concept development; experimentation; and testing. Executed from RDECOM Simulation and Training Technology Center (STTC), MATREX mutually and collectively leverages the world-class expertise of all RDECOM M&S laboratories for the benefit of the Army as well as Joint services. Dynamic Animation Systems is the Prime Contractor for the MATREX Program. 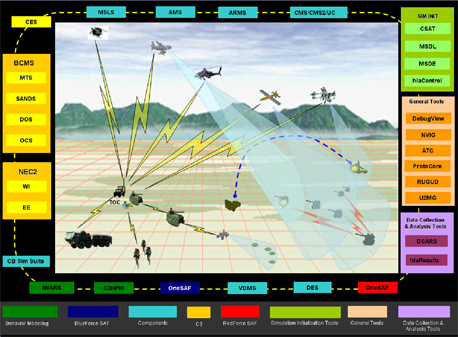 The MATREX Program is a robust M&S Architecture that has been adopted by (and includes models from) RDECOM, the US Army Training and Doctrine Command (TRADOC), the US Army Test and Evaluation Command (ATEC), the Future Combat System (FCS) Program and the US Army Cross Command Collaboration Effort (3CE). It is primarily an HLA-based environment that includes various tools for integrating models into the MATREX environment. These tools enabled ATEC to move its OASIS Federation into the MATREX environment during a two week workshop, achieving a cost avoidance of two million dollars and a schedule advance of eighteen months. MATREX and OASIS received both the US Army M&S Award for Test and Evaluation (T&E) and the Department of Defense M&S Award for Test and Evaluation for this critical contribution to Army T&E. As the prime contractor for MATREX, DAS is confident we can help the CBP integrate M&S into the MATREX environment with similar cost avoidance and schedule advance.